Carrie explained that she didn’t want any hand-outs. She wanted to work for her money. The sad story about her husband dying and leaving her a step-daughter but nothing else brought her to tears. I gave her a kleenex and talked about her options. No, we didn’t have any work for her. Besides, I knew that work for today does not answer the question of tomorrow, the next day, or the next month. I gave her a phone number for someone I knew would be able to help her make a long-term plan and our card so she could follow-up with us. The following Monday she came back to the shop when only Andrew was there. He learned more about Carrie’s story. She admitted she hadn’t made the best choices and kept company with some questionable people. She was held down by threats at the mercies of a local drug-dealer. She had tried calling the number I gave her but when the call went to voicemail, she hung up. She didn’t even have a phone number to leave for a return call. Andrew set her up with a pre-paid cell phone which she immediately used to call the police about her dealer “friend” and then the number I gave her previously. The ball started rolling. A couple weeks later Carrie called us again. She gushed her gratitude for our help – she acknowledged we didn’t just give her something to get by for a day, we helped her think through her choices for the future and treated her like a dignified human being. She’s determined to get off the streets, went through detox, and found a more permanent place to lay her head for the time-being. Carrie still has a long way to go. She still has choices to make that could make or break her, but now she at least has the means to make those choices. I invite you into Carrie’s story to share the value of having people in your life who can help you think through the choices you face. We make a lot of choices every day from where we’re going to live to what we’re going to eat for dinner. We make a choice as to how we’re going to provide that food for ourselves and our families to how we’re going to get to that job that provides that food. When faced with a complicated decision, we turn to others to help us think things through, whether it’s a friend, a business associate, or an expert. Every week people come to Marinelli Auto Service with vehicles that need more than just maintenance. They need advice, someone who cares and will take the time to talk with them. Some of the decisions these customers make are rather simple but others are more complex and take a bit of thinking through to make the choices that will keep the car running, not just for another day, but for the long-haul. It’s not every day that we’ll have someone like Carrie come to our shop looking for help – we’re not a human services organization – though we were grateful for the opportunity. We do, however, have people come in on a regular basis with cars and trucks who need to think through a long-term plan for their vehicle to keep it running well in a way that works with their budget and that’s exactly what we’re here for. 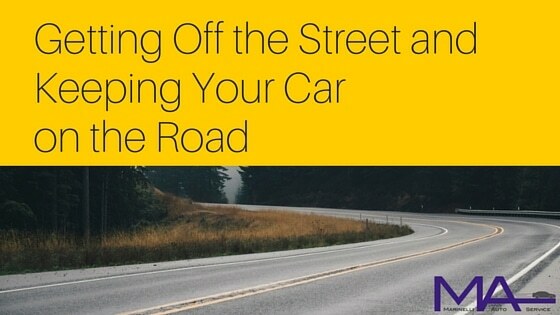 Do you need help making a long-term plan to keep your vehicle on the road in a way that fits your budget? Schedule a Free Consultation. *Out of respect for the woman in this true story, “Carrie” is not her real name.